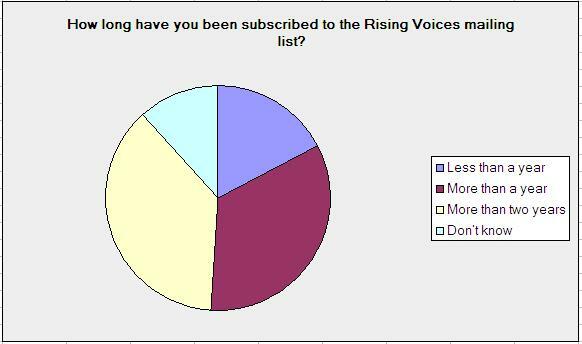 Welcome to the results of the Rising Voices Community Survey. Rising Voices started its journey more than three and a half years ago and its community of grantees, participants, applicants, readers, well-wishers have grown gradually. The community mailing list has now over a thousand members. In December, 2010 we asked our readers and community members what they have found valuable about Rising Voices over these past several years, and what other resources they would like to see incorporated into Rising Voices. Here is the summary of the key findings. We worked with a sample size of 75 respondents, 49% of them have their own blogs and 71% have their Twitter accounts. This shows that Microblogging is preferable to more people. 42% of the respondents have affiliation to an organization which is involved in developing new citizen media projects and 34.6% of the respondents were either a Global Voices author, translator or editor. The majority of the respondents have already subscribed to the mailing list for more than a year which indicates that the growth of members in the mailing list is declining proportionately. And we surely want to improve that by analyzing results from this survey. An overwhelming majority of respondents (72.5%) suggested that regional/country gatherings can improve dialogue among members of the Rising Voices Community. More than half of the respondents suggested that reaching out to individuals can improve networking. 46.4% wanted more interaction via Rising Voices Facebook page/Twitter account (are all community members subscribed to these accounts?). 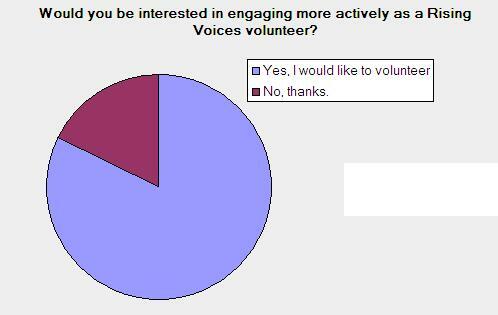 More than a quarter of the respondents wanted that a Rising Voices wiki should be developed and more emails should be sent in the mailing list. A third of the respondents suggested to interact via chat meetings or communicate through discussion forums. These all suggest that community members are eager to talk with each other on the issues listed above. Almost half of the participants opined that offering micro-grant competitions for new citizen media projects is the most important component of Rising Voices. 43% of respondents thought that establishing a support network of citizen media projects in marginalized communities was an achievement for RV. More than one third thought that creating a global network for citizen media practitioners and activists and generating knowledge about citizen media in developing world were other core tasks of Rising Voices. 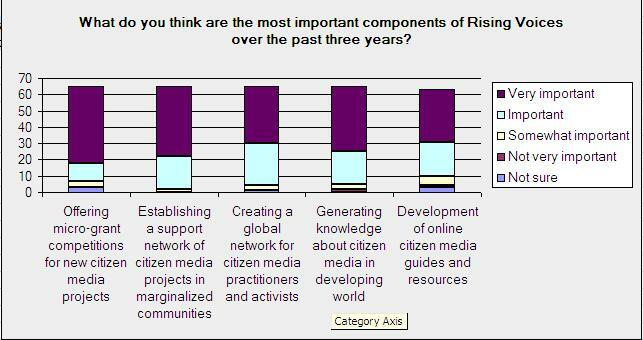 32% vetted for the efforts of development of online citizen media guides and resources. We would like to assure you that the micro-grants will continue this year and we will be keen on developing a global network for citizen media practitioners and develop more online citizen media guides. We have informed earlier that we would be hearing to our readers. An astronomical number of participants (76%) opined that we should highlight case studies of innovative citizen media projects around the world. i hope you have noticed that we have already started the effort. Another strong (72.7%) recommendation was to develop a database of tutorials, how-to guides and workshop curricula, which we will be working on soon. The other recommendations include sharing news about other funding opportunities/global conferences (which we are already doing via our delicious feed) and organizing more grant competitions for new projects – we have taken note. 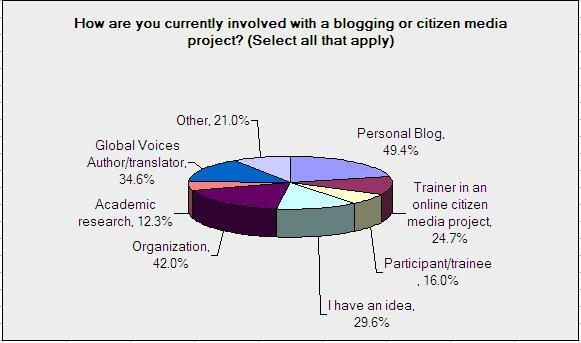 Almost half (47.3%) of the participants opted for mentoring individual bloggers from other countries. Another majority thought that reading and commenting on Rising Voices community blogs would be a form of participation. About one third of the participants wanted to be an author in RV and/or help in translating. What would be your ideal Rising Voices community? Informal sharing of ideas, projects, organizations. Support those in crisis where necessary. A community of people able to make real transformations in their own local communities and also able to spread their experiences around the world to make the change happens. A community which empower people, share experiences, try to gather activists in online and offline events. Please do let us know if you would like to contribute as a guest author highlighting interesting citizen media projects around the world and taking interviews, sending us links, tips etc. Kindly subscribe to the Rising Voices News Letter to stay informed.